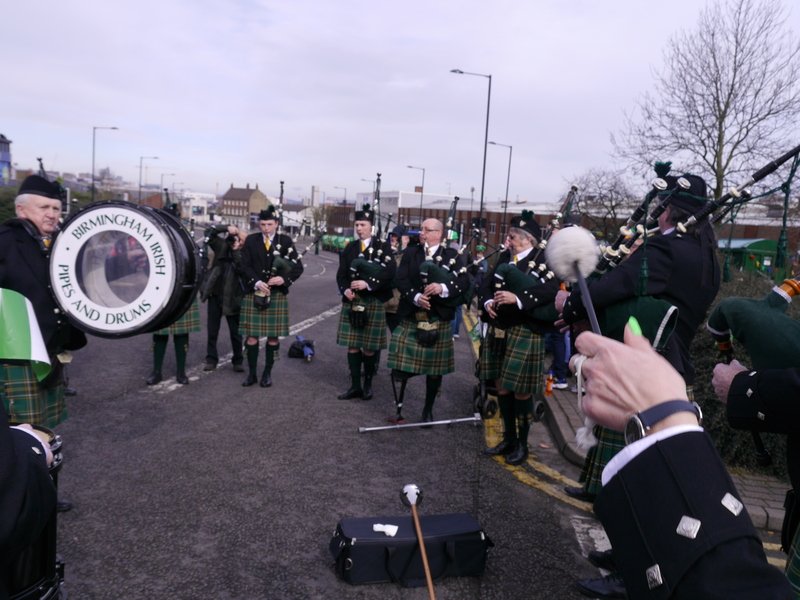 It has been a very busy March as usual with the band playing at The Derby Saint Patrick’s Day Parade, The Birmingham Saint Patrick’s Day Parade, The Sandwell Saint Patrick’s Celebrations, The Sports Bar Cannock Saint Patrick’s Dinner and The Huddersfield Saint Patrick’s Day Parade. Needless to say a few of us were pretty shattered by the end of it. But, the practice and preparation for these events goes all the way back to September. At that stage we decide the tunes we will be playing and start practising them in earnest to tighten the tunes up and we also work on the tuning of the band. 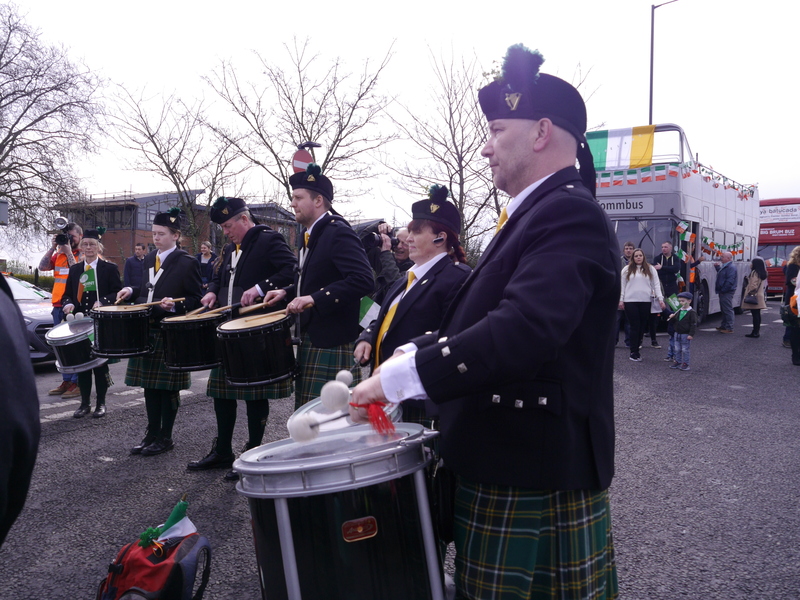 The first event was The Derby Saint Patrick’s Day Parade held on Saturday 11th March. We have played this great event for many years and are always made very welcome. 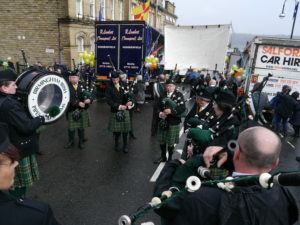 Joel and Oran Grigg initially played the parade committee and dignitaries from the Council House to mass at St Josephs. The rest of the band formed up at midday and marched the parade through the town centre to finish at the The Derby Irish Centre. 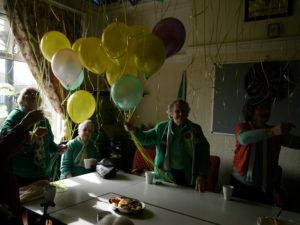 From there it was back home, sort the uniform out again ready for the Birmingham Saint Patrick’s Day Parade on Sunday the 12th March. Before the parade officially started at midday the first ever Emerald Mile Charity run was held at 10am. 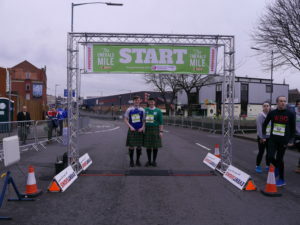 There were only 45 runners for this first time which included band members Joel and Oran Grigg. Running in kilts they showed great support for the parade and the band. Next years run will undoubtedly be bigger and better and will grow over the next few years. Meeting up at 11am at the top of Digbeth the band prepared to lead the huge parade around the streets of Digbeth, the Irish Quarter in Birmingham. As usual it was a huge parade with over 70,000 watching and a parade procession that took over an hour to get past the finish point from us crossing to the tractors going through. A great and huge event. Roll on next year. A little break then till Saturday the 18th when some members of the band played at the Premier Sports Bar in Cannock in front of a packed crowd who were settling in for a great feed and a great nights entertainment. Huddersfield was on the 19th and this is always a pleasure to do. It involves us all getting on a coach and travelling together with family and friends. One thing about the band is that everyone gets on and the craic on the bus is great. 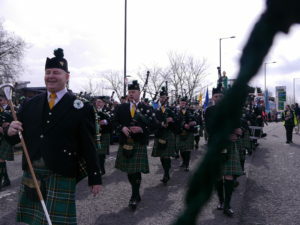 Sunday the 26th March is the Birmingham Indoors Pipe Band Competition where we will be putting out 3 trios and 2 mini bands. We have worked hard towards this and are looking forward to the first competition of the season. © Birming Irish Pipes and Drums 2019 - All rights reserved.